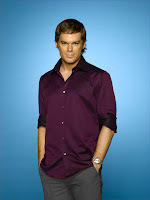 Michael C. Hall: Yeah. (Laughs), we had these at Comic-con. This is the limited edition one-he has a blue shirt. My mom was in town last weekend and I gave her a couple." So there you go. If the Dexter bobble is good enough for MCH's mom, why haven't you ordered another one yet? Get moving, people! !